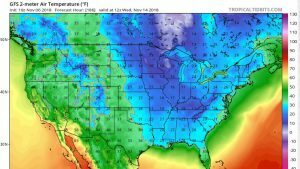 Climate and Agriculture in the Southeast | Are you ready for some cold weather? 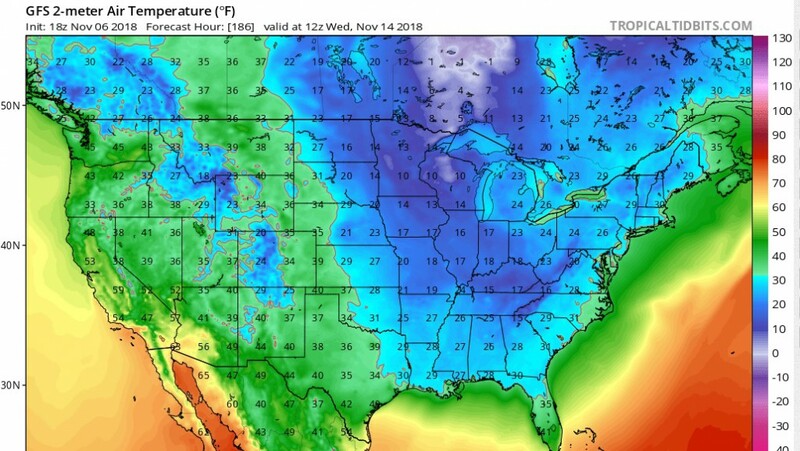 UPDATE: As of Friday November 9, it now looks like most of Florida and the coastal plains of Georgia, South and North Carolina will probably be spared a frost during this cold air outbreak, although scattered areas could still see something. Follow your local National Weather Service forecast for the latest information. I’ve been watching the long-range weather forecasts for the last week, and it’s pretty clear that our growing season across most of the Southeast will end next week as a huge push of chilly air moves into the region. Northern parts of the region will see frost by this weekend, but by Wednesday morning, subfreezing air will move all the way down as far south as Gainesville, FL, putting a decisive end to the growing season. This is about a week later than normal for freezing conditions for Athens GA but will be earlier than normal for southern Alabama and Georgia and much earlier than normal for northern Florida, which has an median first frost date in early December. We are expected to see 2-3 nights of freezing conditions in a row, so you probably won’t be able to save many gardens by covering the plants. Since the forecast is just a week away now, confidence is growing that this will actually occur. What is especially amazing to me are the temperature forecasts in the mid-teens for the higher elevations of the Southeast, including the north Georgia mountains. You can see maps of freeze probabilities at 10, 50 and 90% probability of occurrence at http://agroclimate.org/tools/freeze-risk-probabilities/. If you want more information on where to get frost forecasts, check out my blog post at https://site.extension.uga.edu/climate/2017/10/where-to-get-frost-and-freeze-forecasts/. The Midwestern Regional Climate Center’s VIP program has climatological maps of frost occurrence at https://mrcc.illinois.edu/VIP/indexFFG.html. Other places to find frost climatologies are discussed at https://site.extension.uga.edu/climate/2015/10/is-this-years-frost-earlier-than-usual/. Posted in Climate and Ag in the news, Climate outlooks, Sources of weather and climate data, Tools for climate and agriculture. Bookmark the permalink.